Preface: This picture has nothing to do with the rest of our great day, but it was so much fun, we have to show it. 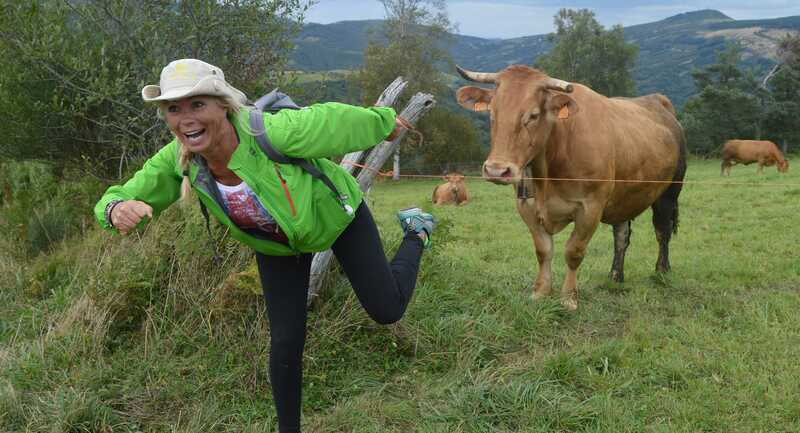 It is the only mention of cows in the story, but the picture is first class. Pauletta and Carlatta are happy tonight. Relieved is more like it. They will sleep well. For horses. They did their jobs today and deposited two novice horsemen from Las Herrerias to O Cebreiro without missing a beat. Fear was riding with both of us for the first ten minutes, but honor won the day and we made it to the top, very proud of ourselves for managing to hang on to two well-trained horses. Come to think of it–we really didn’t do a lot. They did all the work. As we said yesterday, we stopped at the Alpaso horse business in Las Herrerias yesterday to reserve two of their finest for the march to O Cebreiro this morning. Jim hasn’t been on a horse since he was two years old–a faded photo showing him with wide-eyed panic attests to the fact that he did indeed manage a few seconds on that horse. Jacqleen’s (her new name) equestrian experience was at the Midland County Fair–she clearly remembers circling the post with her miniature steed while her the carney walked at her side back then. Back when she was just Jackie. So we were up early–actually neither of us slept well–We are sure that riders are nervous before the Kentucky Derby, too. Breakfast was quick at our hotel and then we made the lingering walk to Alpaso. It is more than one-half mile. Turning a corner, we spotted our guide, Victor, busily brushing down the horses. We were too early, he said, and we were to go sit at a closed bar where two young German girls were already waiting for the trip. 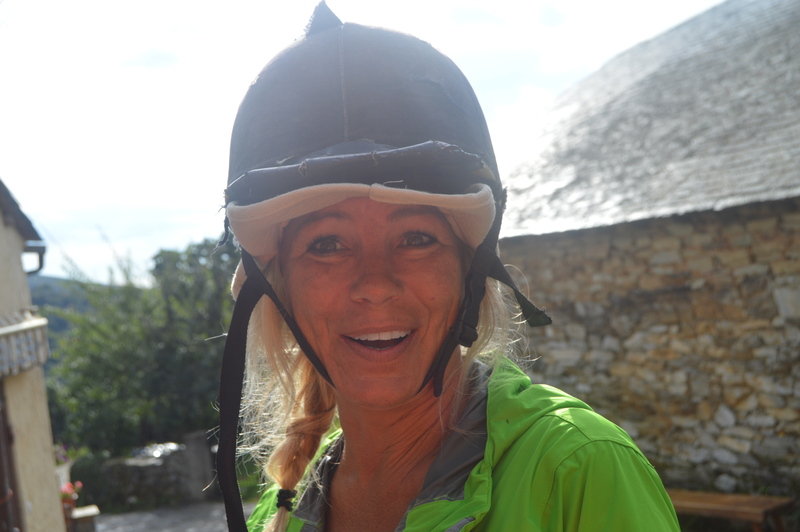 We waited and talked to the young girls–both had done some riding. Both had started in St. Jean. Both were confident and sweet. He’d chosen horses for each of us depending on our skills levels–the German girls were the skilled ones. Victor gave us all protective helmets, a few lessons to turning and stopping the animals. We mounted and in no time we were on our way. 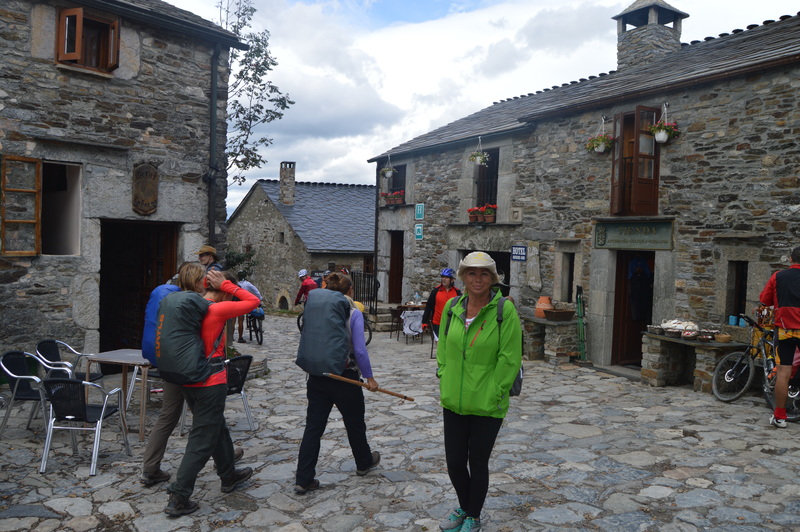 We were using the same path as the walkers to O Cebreiro, and often they made way for us. There was more than one jealous Pilgrim. We smiled. Our trip to the top took about 90 minutes. We made one stop. The horses took water. We stayed in our saddles. Our horses had issues. Jackie’s–oops Jacqleen’s–was depressed. Jim’s was schizophrenic. And the views from the saddles were breathtaking. 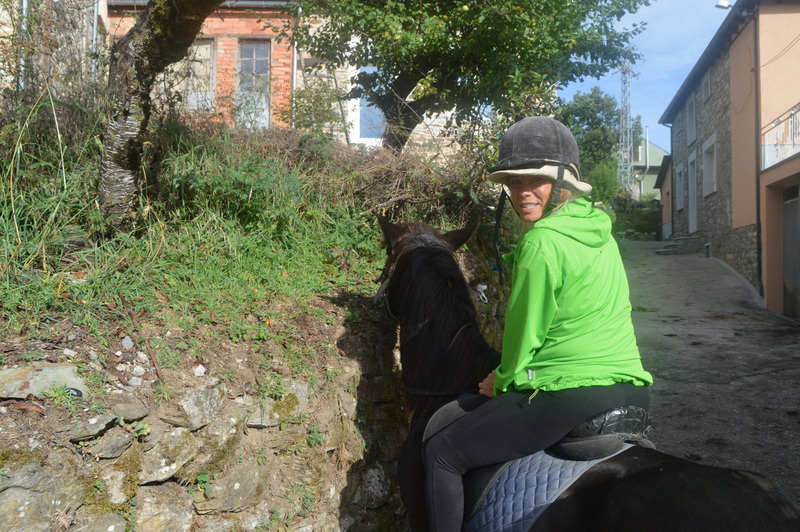 Besides the obvious advantage of not exerting much leg energy by using horses, another very big plus for horsing up the mountain is the views from the saddle. And Victor–he is amazing. He is gentle but very confident and kept us all moving with no incidents of any kind. 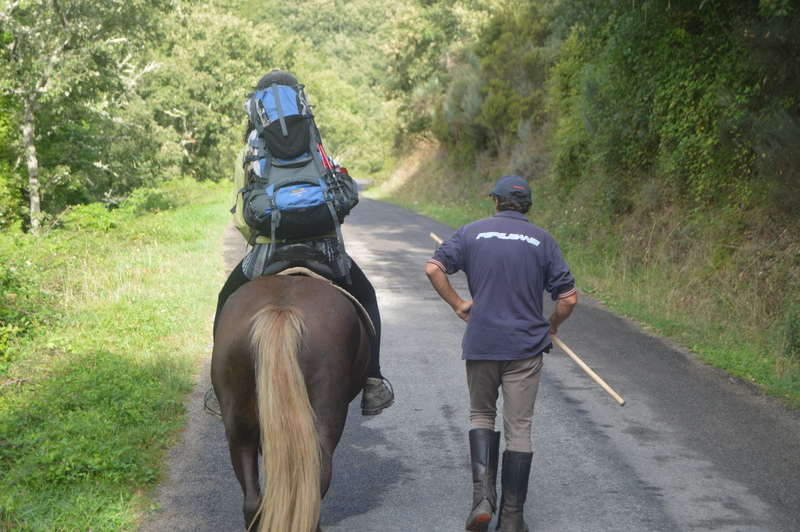 He talked about future plans of guiding tours all the way to Santiago with his horses. Until then he makes the daily trips with his gentle and dependable horses. He was perfect, and we loved it more than anything. 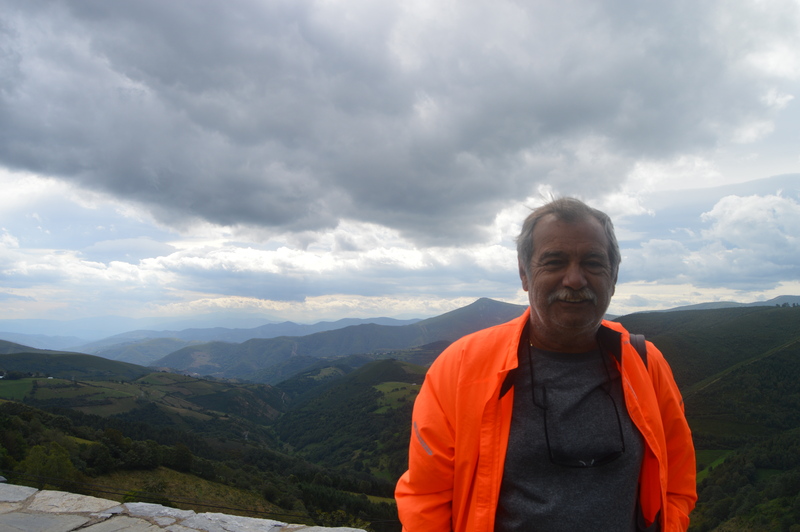 His website is alpaso.eu—30 Euros per person–A bargain!! We loved it!! LOVED IT!! LOVED EVERY MINUTE OF IT!!! 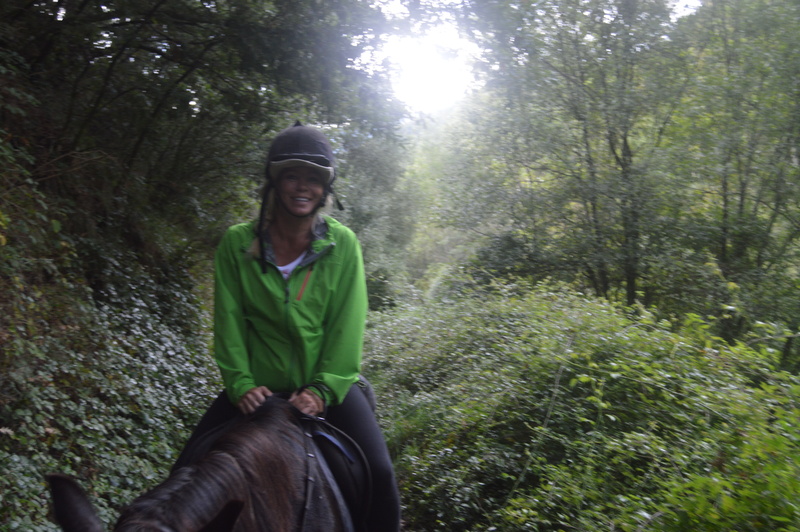 It was one of our best times on the Camino. We would do it every time. we were ready to walk back down, just so we could ride up again. 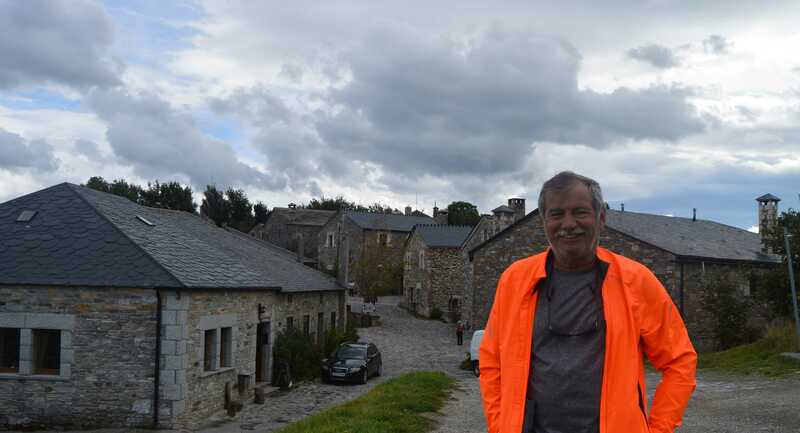 The top of the climb is the very small village of O Cebreiro. When we arrived the weather had turned chilly and breeezy. It was near 60 degrees and the wind was strong. It’s tiny and the perfect tourist village–for Pilgrims. The Celtic culture is pervasive in the music and buildings. Jackie, whose Irish heritage is strong, was in heaven when she heard the O Cebreiro background music of bagpipe music. 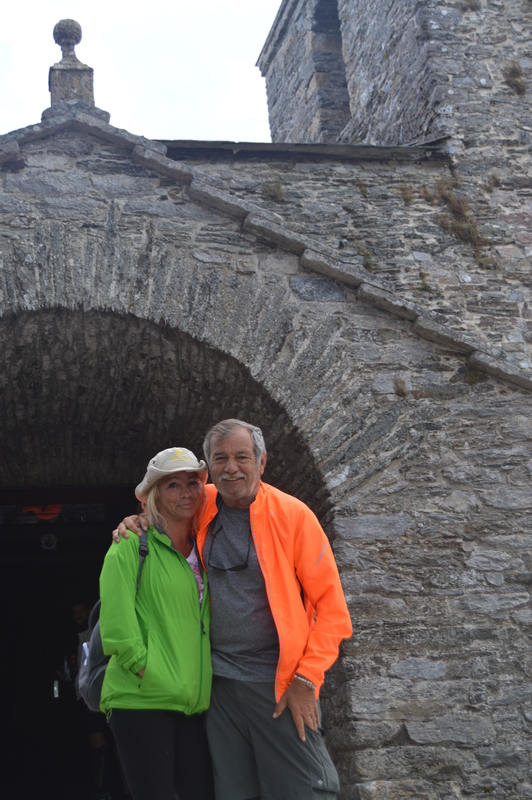 We visited the church, which Victor said was from the ninth century. A monk there stamped our passports, which are nearly filled and sold us two new ones for the rest of the Camino. 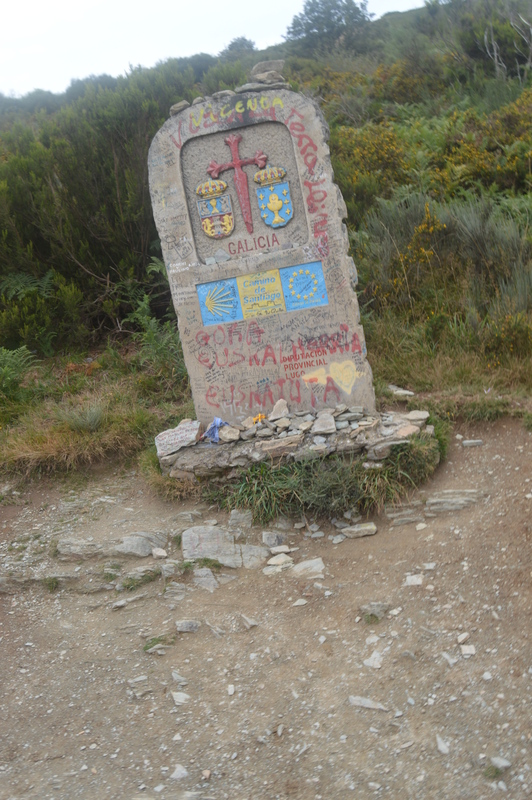 As we left the town, we saw a Camino monument that sits high above the Leon/Galacia valley. 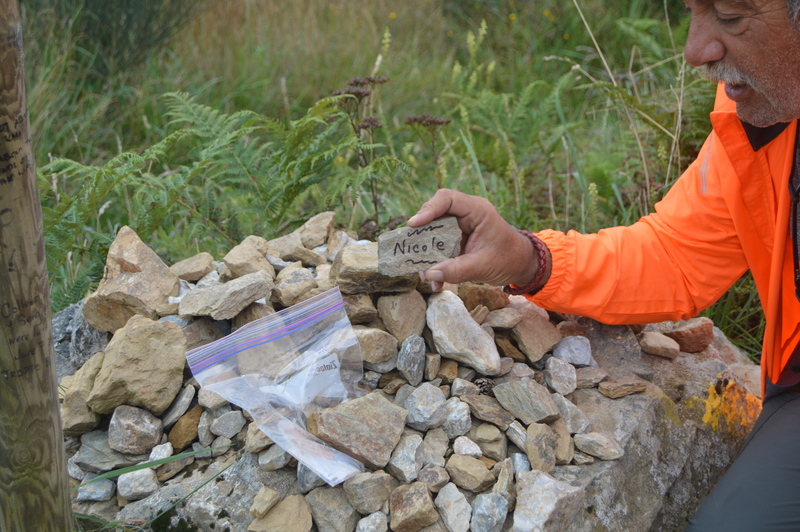 There, Jim left his stone for his daughter, Nicole. She was in his thoughts today–partly because he knows that she would have shared his trepidation for the trip uphill. It was her day. And, because we hung around as long as we could, it was mid afternoon before we hit the trail. It was cold and sprinkling whn we had traveled to Hospital de Codesa. Aware that our ur hotel reservation was some distance away in Samos, where we wanted to attend tonight’s Pilgrim Mass, we called a taxi and skipped ahead to Samos, where we are tonight. 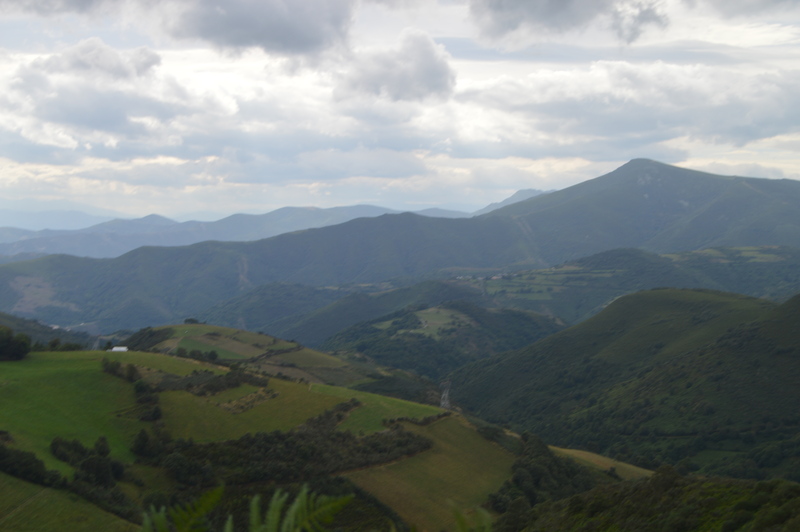 The walk and ride from O Cebreiro is as stunning as it was coming up the hill. 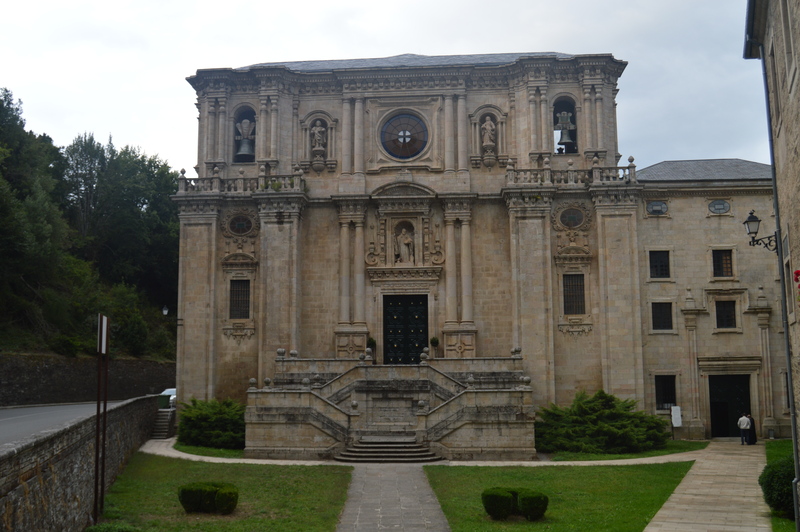 Tonight–promptly at 7:30–in Samos at Benedictine Monasterio de San Julián de Samos. We were at Pilgrim’s Mass. There were probably about 20 Pilgrims in attendance. The Mass is officiated by the monks. 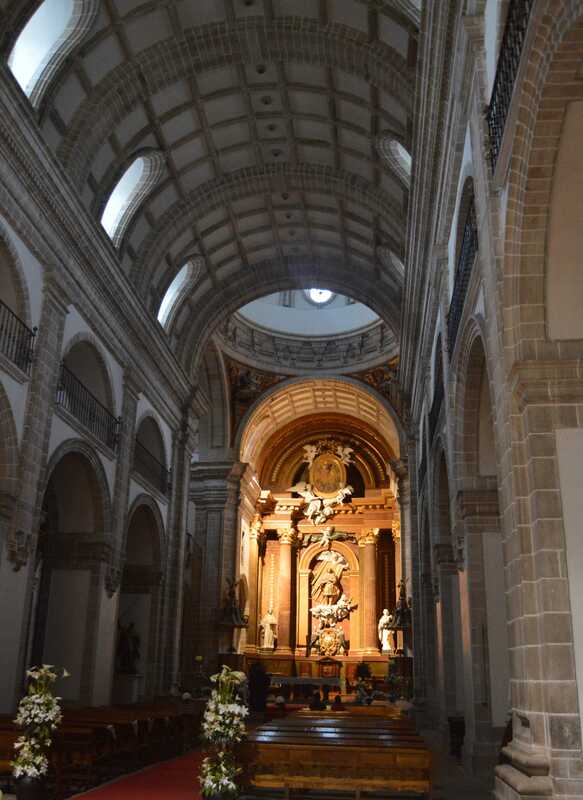 When the normal Mass was completed, one of the monks came forward to say a special Pilgrim’s Mass. When he was finished he walked through the aisle sprinkled us with holy water. It was cool. Great end to a perfect day. After the uplifting Mass, we walked to get ice cream from the nearby bar. As we sat outside, we watched a handful of new Pilgrims shuffle past. Young…early 20’s….showing the new dude-on-the-Camino walk. All of them. 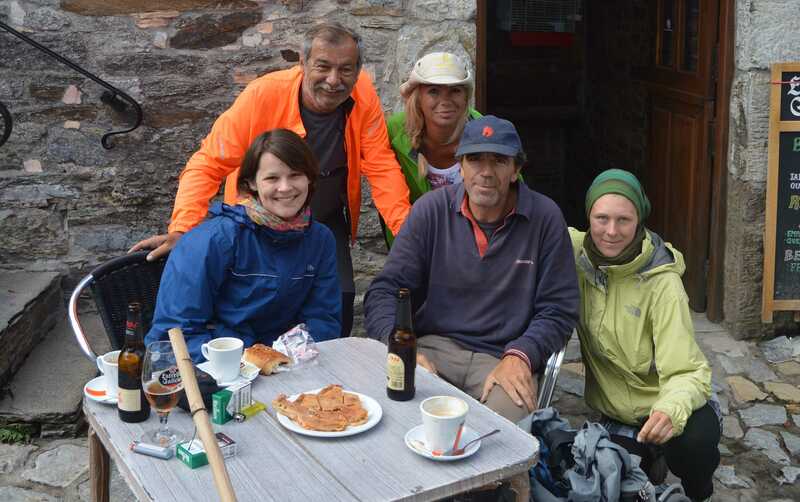 We accurately guessed they had been on the Camino for three days. They smiled and we smiled. Everyone has to go through it. And us–We have Pilgrim horsemen butts tonight. Very sore. We have packed a very light computer and a great Nikon DSLR. We just do entries every night. It is tough to know the cost. We use Wifi when we can. Me ha encantado leer este blog y lo que opináis de mi empresa AlPaso. Un saludo, volved pronto.